Everyone Has A Granola Story. Here’s Ours. 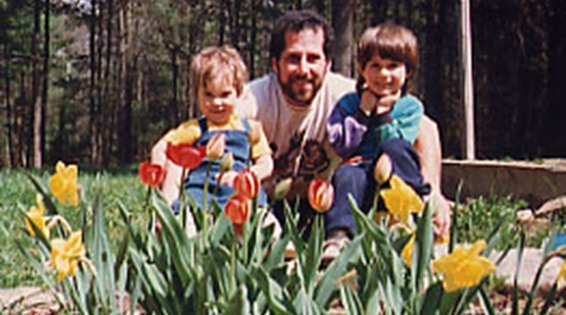 … in his parent’s kitchen in Bayside, NY. The aroma of freshly baked granola filled the neighborhood. Friends stopped by to assist in the mixing and baking process and were rewarded with the freshest, most flavorful granola. “This is delicious”, they said. “Can I buy some?” And a business took shape. After taking over the dining room and kitchen with bags of rolled oats, cases of nuts and raisins and bottles of honey (and after a few ‘spills’), Saul’s mother suggested it was time to leave … and find a new production facility. 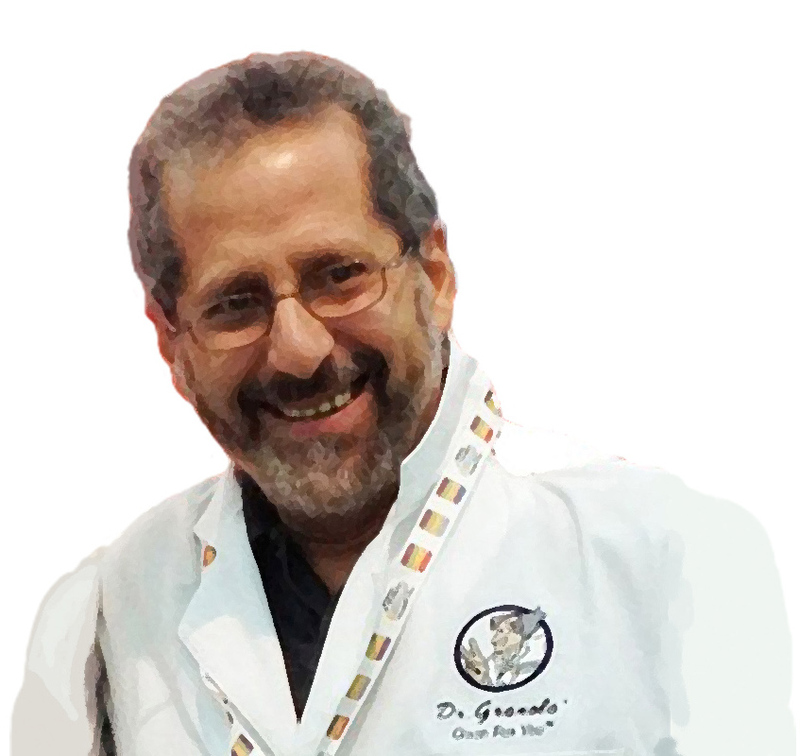 Saul approached his friend Dominick Ortiz who owned and operated the Quantum Leap Natural Foods Restaurant in Fresh Meadows, NY. A deal was made, the ovens stayed on at night and the delicious aroma of fresh baked granola drifted over more neighborhoods. 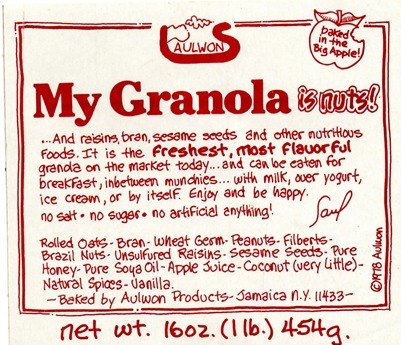 Dom offered Saul’s granola on his breakfast menu and as a dessert topping on ice cream. Sales and appetites for Saul’s granola began to percolate. 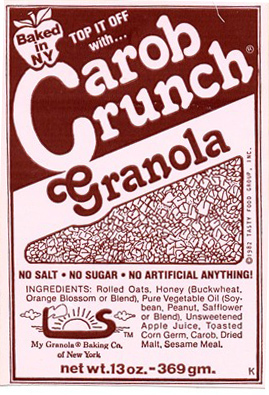 Down the street from The Quantum Leap Restaurant was the Organic Energy Food Co-op … one of the first organic food co-ops in New York City and the first commercial retail account for Saul’s increasingly popular granola. One day while making a granola delivery to the co-op a customer inquired (it really happened just like this), “This is delicious. Whose granola is this?”. 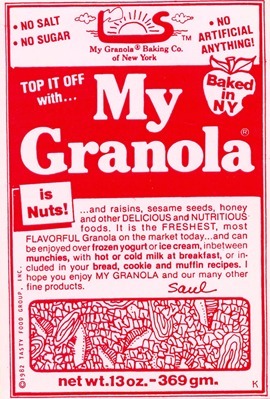 Saul responded, “It’s my granola.”. And the rest, as they say, is history! My Granola IS NUTS! is still making history today … 43 years after that first batch in Bayside, NY. But back to 1971. The Natural Foods wave of the early 1970’s was gathering steam and retail health food stores sprouted throughout the metro New York City area. Perelandra Health Foods (Montague St, Brooklyn, NY), Panacea Health Foods (several stores in Manhattan), Muscle Mite (W 23rd St, NYC), Whole Foods (the original independent health food store on Thompson Street in Greenwich Village – not to be confused with today’s Whole Foods), Sunshine Health Foods (W. Houstan St, NYC) and many more retail health food stores from Long Island to New Jersey to Upstate New York now offered My Granola IS NUTS! With a backpack full of newly labeled bags of granola Saul visited the growing number of health food stores, co-ops and gourmet delis spreading the delicious flavor of My Granola IS NUTS! Production quickly outgrew the Quantum Leap’s ovens and a larger production facility was needed. Saul moved the entire operation to a 9,000 sq. ft. manufacturing plant where the company produced and distributed granola to growing markets locally, regionally and nationwide. 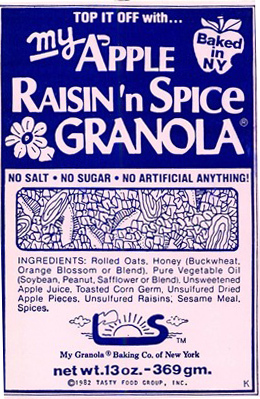 New flavors were introduced, including My Chocolate Nut Crunch Granola, Carob Crunch Granola and My Apple Raisin ‘n Spice Granola (Marsha’s favorite) and new markets were ‘discovered’. In 1975 Saul met Steve Beninati who just opened ‘Everything Yogurt’ … the first store in New York selling frozen yogurt. Having a flair for marketing they both realized, “Hmmm, granola! Hmmm, frozen yogurt. Hmmm … TOPPING!” Both companies grew as did the friendship and adventures between Saul & Steve. New flavors and variations of sweetened, unsweetened and low fat granola were ordered by gourmet & specialty food stores, restaurants, hotels, Inns & B&B’s and ice cream & frozen yogurt stores. A splendid time was had by all. … destined to become the #1 Granola Shopping Solution for people throughout the United States, the world and the Universe (OK, the known Universe)! 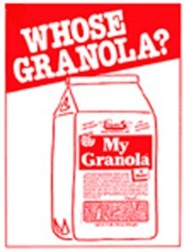 Business was booming for granola. … and, once again, a splendid and unforgettable time was had by all. 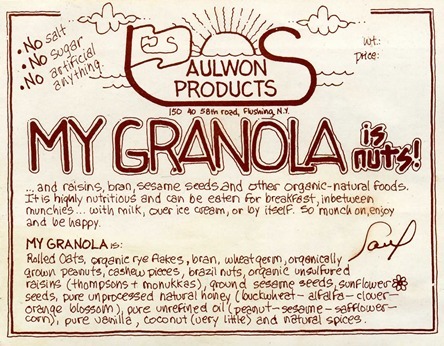 Over the years … as a cereal, snack, topping (on ice cream and frozen yogurt), granola bar, cookies, confections, ingredient in trail mixes or a natural baking additive … Saul has introduced a wide selection and variety of granola products into new & exciting markets. As a result of its dynamic growth granola has earned its rightful place as a healthy staple in our daily diets. Add your own favorite dried fruits, nuts & special flavors. The Freshest, Healthiest & Most Flavorful Granola Available Anywhere! Because It Comes From YOUR Kitchen! Bake it for yourself and your family or send as a gift to others! We look forward to serving your granola needs. 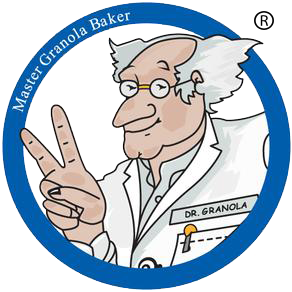 Dr. GRANOLA® & the crew at 1-800-GRANOLA.com. 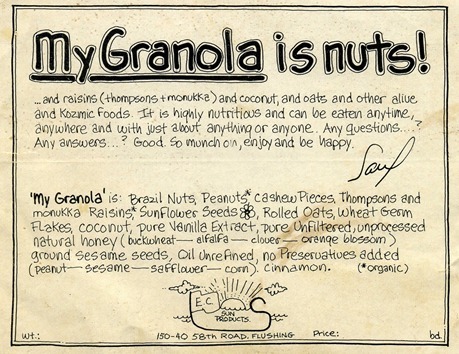 1971 – The first … My Granola IS NUTS! retail label. Notice the initials ‘bd’ in the bottom right corner (Brian Davis). Your Granola And Gift Giving Solution!